Freddie Delia was born in Cospicua on March 6, 1939. His family moved to the relative safety of Kalkara for the duration of the war and it was in the wide open stretches of this peaceful seaside village that he learned his football. Although born and bred in the Cottonera area, Delia started his career with Zejtun Corinthians, whom he joined on leaving De La Salle College in 1955. Although only 16 years old, he played regularly for the senior team but when St George's won promotion to the First Division in 1956-57, Delia found the temptation of joining his home club too big to resist. The next season he was featuring in the top division of Maltese football. Delia was rather small in stature but he compensated for his lack of height with his enthusiasm and forceful play. Although the halfback line was undoubdetly his best position, he proved equal to the task whenever he was asked to play as a forward. In a career spanning more than a quarter of a century, he proved his versatility in no small measure. In fact, his first league game with St George's was on the left wing against Birkirkara in 1957-58 when he scored the two goals which gave the Saints victory. In 1959-60, he was switched to inside left in place of 'Scotch' Scicluna who was out of the game nursing an injury. In that position, he gave a very creditable performance in the Saints' memorable victory against Grazer of Austria. The late fifties and early sixties were good years for St George's. The Saints had a strong team in those days. However, they could not hold on to their promising youngster. In 1963, Delia joined Hibernians and for the next 11 seasons, he was a prominent member of the Paolites' all-conquering edition. Delia won two championship and two FA Trophy medals for Hibernians in a glittering career which took him to the very top of Maltese football. 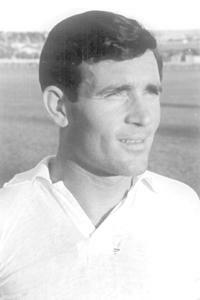 He was also league top scorer in 1966-67 and was capped seven times by the National XI. I have never witnessed a better half-back in 50 years of following Maltese football. His elegant yet bold play made him the scourge of opposing inside-forwards and his incursions in the opposing penalty area earned him a reputation as a prolific match winner. Delia was also strong in the air, showing a particular way of rising for the ball which I have never seen in another player. Freddie used to incline slightly back while leaping, thus preventing his opponent from reaching his full height. I knew Delia personally in my days with the RAF where he served as a fireman. It was a pleasure to discuss football with him on Monday mornings at the station's canteen. Freddie played regularly for the RAF XI during his years of service, teaming with such Maltese football greats as Robbie Buttigieg and Edward Darmanin to mention a few. In 1974, Delia was transferred to Vittoriosa Stars in the Second Division. He stayed for two seasons with the Stars before rejoining St George's in the top division. Although by this time he was getting past his best, he was still a very valid player. After three seasons, however, he decided to retire from first-class football and in 1979, he joined Kalkara United as a player-coach. In his first season in charge, the team won promotion to the Second Division. Then, in 1981-82, he moved to Ghaxaq FC but after playing six matches for the first team, he decided to call it a day. Freddie Delia will never be forgotten by those who, like me, were keen followers of Maltese football in the sixties and seventies, especially those who come from the Cottonera area.